Do you enjoy horseback riding and do you want some time for other activities? Or are you a novice rider? Then starrides are definitely for you. 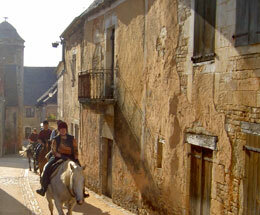 Every day you start at Domaine des Garennes and have a pleasant ride in the area. You stay in our guesthouse. Alternately we have a morning and a day tour. During the day rides we have a picnic or a lunch at a table d’hôte. During the summer, from June 30 untill September 1 there is only a morning program. On Saturday afternoon, you arrive and meet the other riders. Sunday morning you get together with “your” horse. The idea is that you will ride this horse all week. You brush and saddle your horse and then we make a “try out ride” around. Sunday afternoon you can fill in the way you like. These days we have, like Friday, a day trip. We start the morning taking care of the horses, then we set off. We ride to a restaurant or a small farm where we enjoy a lunch with local produce. Alternatively we have a picnic in a beautiful spot. During lunch the horses rest in a pasture, so you can quietly enjoy your meal. After that you can have a little siesta. Late afternoon we return to the domaine. First, we take care of the horses and put them in the meadow. Before dinner, you still have plenty of to refresh and relish an aperitif. In the morning we ride through the nearby woods. We visit Nadaillac or go to the windmill in Gignac. Once home we take care of the horses and rest them in the meadow. Then we have lunch at des Garennes. In the afternoon you can explore the area, laze by the pool, playing tennis or just relax. Friday we have our final day tour. In the evening we enjoy a farewell dinner with specialties from the Périgord region. You return home Saturday morning after breakfast. There are double and triple rooms available in our guest house. The rooms are simple, but comfortable. All rooms have a private bathroom with sink, toilet and shower. Your holiday is full board from dinner on the first day through to breakfast on the final day. You can sample fresh local seasonal produce, regional cuisine and wines. On request we also prepare delicious vegetarian meals. Mention this, and/or any dietary wishes when booking. The table wine during meals is included. You must pay seperately for other drinks during your stay. We recommend using a safety helmet and breeches or seamless pants for riding. In addition you need comfortable boots or sturdy (mountain) shoes with a heel and coarse profile (to avoid slip out of the stirrups). If you opt for shoes wear them with chaps to protect your ankles. Do in every season care for rainwear and warm(er) clothes for the evenings. And be sure to take your bathing suit. Throughout your horseback riding holiday you ride the same horse. We first ask you what kind of horse you prefere and then we try to make a good match with one of our horses. Occasionally it happens that there isn’t a right chemistry between you and your horse. In that case, you always can have a horse exchange. During your stay you are in close contact with your horse. Often you get the horse from the meadow yourself, you brush and feed it, (un)saddle it and put it back in the pasture after riding. In this way you very quickly get a close relationship with “your” horse. On the (three) half day rides you ride about 2 to 2,5 hours. The tours on the (three) full day rides takes 4 to 6 hours. Your group consists of maximum 12 participants. In ours saddlebags you have some space to take with you a bottle of water and some small stuff. 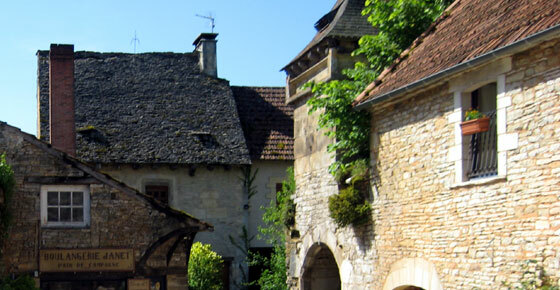 During the tours will ride through the varied landscape of the Dordogne: forests, grasslands, open fields and villages. The area is rugged, stony and slightly hilly. We will ride all gaits, but because of the rugged area we have a predominantly quiet pace. From June 30 to September 1 we only ride in the morning because of the often high temperatures. We then leave extra early. If the weather permits full day rides are possible at additional costs. Linen and towels are provided. You need to bring a towel for swimming yourself. After riding most guests wear comfortable, casual clothing.